About a week after I first heard of Wilhite's B-B-Q in Creedmoor (on FM 1327, between I-35 and US-183), Brad and I made the short drive from Austin. There isn't much along the road, we were looking for it, and we still missed it. Had to call 'em and find out that the restaurant adjoins the Valero gas station. The man in charge (the one I spoke to on the phone) was standing in the doorway waiting for us as we pulled up. He greeted us with a smile and a big handshake. Wilhite's has a laid-back vibe. Their menu is quite diverse, but we stuck with BBQ, obviously. The rock pit area is rustic. Service is really good. The flavor and glaze of the pork ribs were pretty good, but the ribs themselves were really rubbery,. The brisket made a good sandwich. Ordered plenty to go after we finished. Didn't try the sausage. Yes on the sauce. Coverage from Taste of the South! Man Up Texas BBQ, LLC, is honored to have two of its ventures (Man Up: Tales of Texas BBQ and The Q Card) highlighted in the current edition of Taste of the South magazine. Sincerest thanks to Brooke and all of the Taste Mag staff for including us. And be sure to follow Taste Mag on Twitter. 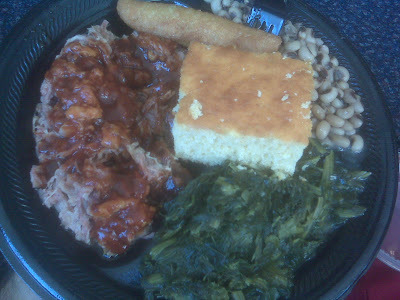 I had heard of Chief's BBQ & Grill but had no idea it's just a 5-minute drive down the street from the house. Brad and I hit it up for lunch a couple of Saturdays ago. Since we were the only ones dining in, I didn't get the funny glances from nearby patrons I usually get when I start snapping close-ups of the food. Not that I care; just saying. The guy behind the counter was very friendly. Not surprisingly, he was wearing a Red Sox hat. (We Sox fans are good people.) Brad and I split a 3-meat plate (brisket, pork ribs, and ham). I didn't have the fries, and the green beans and corner didn't really have any taste (I didn't care, b/c I rarely get sides - it was just a good deal. ), but the meats were good. The brisket was a tad too dry, but the flavor was on, and the smoke ring was prominent. The pork ribs had a great crust to them. I would have liked a bit more meat on them, but they were not fatty at all. I would get them again. And I would definitely order the ham again. The pieces were pretty thin, but that won't be a problem next time when I order all meats, b/c I'll load up on the ham and stack the pieces. All in all, 3 good meats. I'll go back - and not just b/c it's so close to home but b/c it will be a good protein fix. 2 Gameday Giveaways of The Q Card this weekend! Announcing the giveaways earlier than the previous two weeks, to give you plenty of time to ponder your predictions for 2 games: (1) SMU @ Rice (Saturday at 6 PM Central) &, breaking from the nascent tradition of only doing giveaways for intrastate games, (2) Texas-Oklahoma (Saturday at 2:30 PM Central). Get your predictions (winner and final score) to me through whatever means: comment below this post, email, Facebook, Twitter, whatever. Each giveaway closes at the respective kickoff. Main Street Bar-B-Q (Dripping Springs, TX) is now closed. Main Street Bar-B-Q (formerly Riley's) is now closed. No word on whether another BBQ joint will take over the space. Someone correct me if I'm wrong, but I think this means that there is now no BBQ joint in Dripping Springs. WHAT: County Line is hosting its first “Pitmaster Cooking Class”--presented by its own BBQ pitmaster and chef Garrett Stephens--on Friday, October 1, at 7:30 p.m. at the County Line restaurant on IH-10 West. Class participants will enjoy a full serving of each of the four courses as Stephens demonstrates how to prepare each dish, taking questions from the guests as he cooks. Everyone receives a recipe book, with space to take their own notes. • Beers and ales from Freetail Brewing Co. Welcome reception begins at 7 p.m. and then the class will begin at 7:30 p.m. The cost for this live cooking demonstration, recipe book, cocktail reception and four-course dinner is only $30 per person (does not include tax and gratuity). Complimentary craft beer will be provided by Freetail Brewing Co. Since the grill will be fired up, the cooking class will be held outside on the restaurant’s shaded patio; in case of rain, the class will be moved inside. Sponsors include Freetail Brewing Co., Barbeques Galore, Whole Foods Market and Jose Cuervo Tradicional. NOTE: The next Pitmaster Class is planned for Friday, November 19; follow County Line on Facebook or call the restaurant at 641-1998 for updates on the monthly class schedule. Welcome reception at 7 p.m.; class begins at 7:30 p.m.
To make a reservation (space is limited), contact Garrett Stephens at 210.641.1998 or garrets@countyline.com. Follow County Line on Facebook for updates on the class schedules, the restaurant’s music events, and other specials at County Line. QOTD: What's the best airport BBQ in the U.S.? Following up on yesterday's post about my go-to BBQ spot in the Charlotte airport, today I ask where to find the best airport BBQ in the country. I can't suggest that Brookwood Farms is the best there is, b/c I haven't had all that there is. 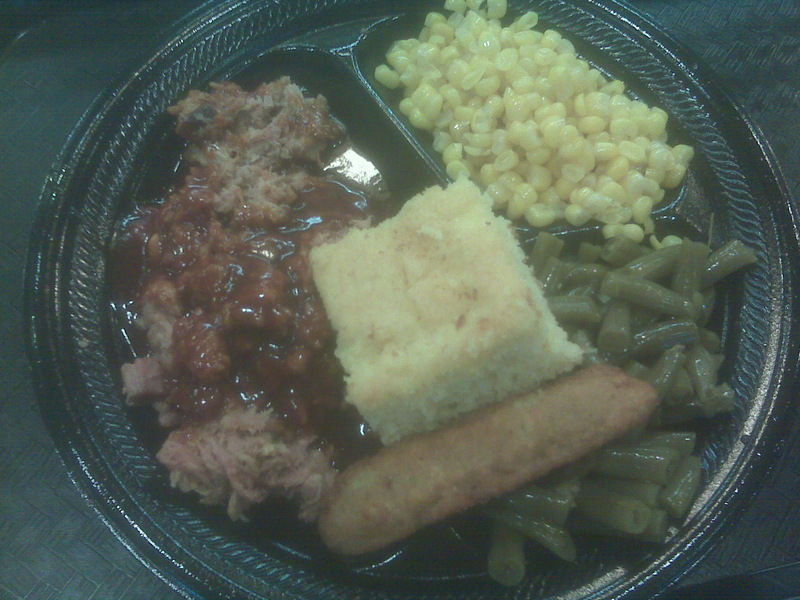 But, without a doubt, it is far and away the best airport BBQ I've had. What tops your list? Harlon's or Pappas in Houston (IAH)? Cousin's, Dickey's, or Railhead in Dallas (DFW)? The Salt Lick in Austin (AUS)? Corky's or Interstate in Memphis (MEM)? Neely's or Whitt's in Nashville (BNA)? Brookwood Farms in Charlotte (CLT) or Raleigh-Durham (RDU)? I should've learned by now to keep a camera in my car, for the unplanned stops. Last night was one of them. I was on West Parmer and saw a BBQ place on the left, so I U-turned it and stopped in for dinner at J&J Breakfast BBQ & Burgers. The place was clean, had plenty of indoor and outdoor seating, and a couple of big tv screens (my beloved Red Sox thumping the Yankees on one of them, and the Horned Frogs and Mustangs getting under way on the other). Throw the Cowboys-Texans game (Sun @ noon Central) in the mix. Same contest rules as for the other two Gameday Giveaways (TCU @ SMU and Baylor @ Rice). Last weekend, The Q Card had a giveaway for the closest prediction for the Texas-Texas Tech game's outcome. This weekend, we've got 2 more giveaways for a couple of intrastate gridiron faceoffs: TCU @ SMU (Friday at 7 PM Central) and Baylor @ Rice (Saturday at 7 PM Central). One card for each game's closest prediction. Same setup as last week. Tell me the winner and the score. Submit it as a comment on the blog or Facebook, reply or DM on Twitter, or email me. Each contest closes at its respective kickoff. (1) For the sauce: What well-known griller did Gretchen once work for? (2) For the rub: What food business did Jeff work for, while growing up in Highwood, Illinois? Growing up Jeff worked at Poeta's Food Mart in Highwood, IL. Famous for it's homemade italian sausage, Jeff worked Highwood Days as a teenager and grilled thousands of sausages and marinated skirt steaks that were sold at the festival for Poeta's. Jeff worked as a caterer and grilled for Poeta's as well. He learned to make Italian sausage, de-bone chicken breasts and trim beef tenderloins. His Poppy taught him to BBQ on the gas grill that was always on the deck at his childhood home and he often grilled for the family. Gretchen moved to Chicago from Buffalo and met Jeff while working for Elizabeth Karmel and learned the art of grilling from the master. Gretchen worked on the Weber Grill account for many years and honed her skills in cooking attending many James Beard dinners and learning how to grill from Elizabeth and the many experts they came in contact with. Gretchen taught Jeff that there was more to life than skirt steak, burgers, sausage and chicken breasts. Gretchen took Jeff to the world famous Memphis in May BBQ Contest and their life changed forever. Gretchen and Jeff began to grill together after getting married in 2000 and they honed their skills, getting their first Primo Smoker and learning to smoke ribs, chicken and sausage. They love to grill everything and the only thing that goes in the oven is stuff that just will not work on the grill. (Mostly chicken fingers for their two children) Jeff has mastered ribs and is working on smoked brisket. Their specialty is beer can chicken and their annual Thanksgiving feast which includes BBQ Turkey, always cooked on the grill, never in the oven and many racks of smoked baby back ribs. Ribs became a tradition because Gretchen's father Harold was not a fan of turkey. Now the ribs are the biggest hit and the crowd grows every year. We hope you enjoy all of our products as much as we do and please have a look at our BBQ Pro Shop Blog for more information and updates about what we are cooking, BBQ Joints we have visited and new products. To all of you, from both of us at BBQ Pro Shop - Thank you, thank you, thank you for your business and Happy Grilling! Thus far, our Battle BBQ feature has pitted Texas against Alabama, Georgia, Kansas City, Memphis, Mississippi, New York City, and North Carolina. Whom should Texas face next? Big day of BBQ, and I'm missing it. 50% savings at Blue Ribbon Barbecue! 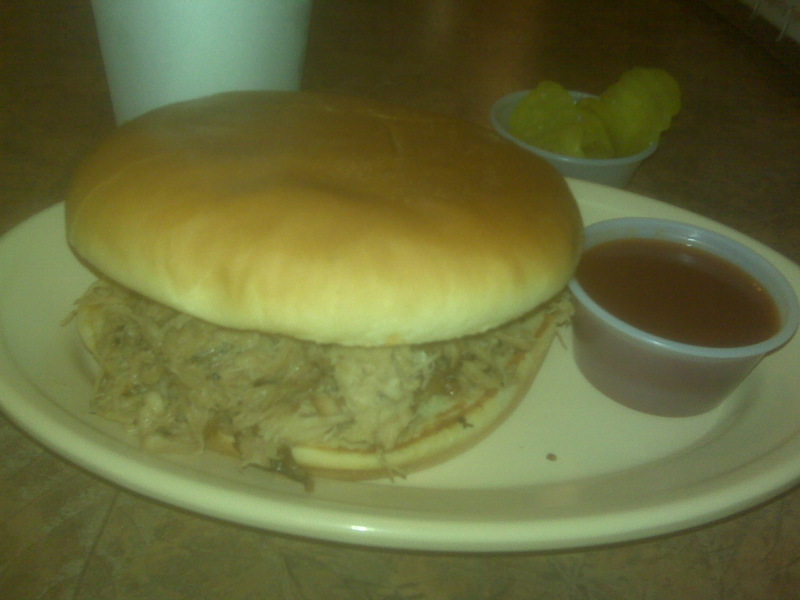 QOTD: What's your favorite BBQ sandwich? Memphis in May BBQ: The Shed smokes a whole hog.